The Clark County Regional Justice Center collocates four court systems within a single facility. The 19-story, 710,000 square-foot complex houses district, justice, municipal and state supreme courts. The building echoes the traditional courthouse by providing an elevated glazed entrance plaza, or civic square, that projects a strong identity to the street. 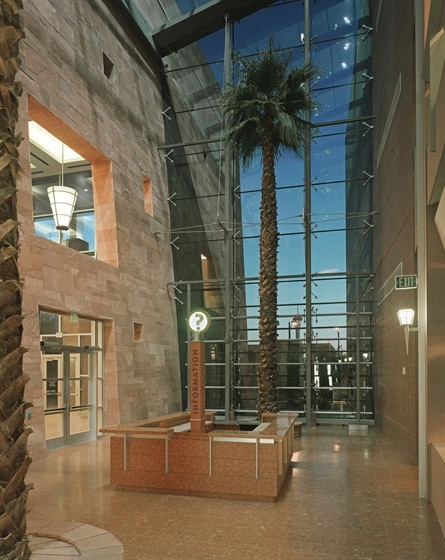 A three-story glass atrium draws daylight deep into the heart of the building, a canyon-like area with native sandstone walls inscribed with quotes reflecting the universal concept of justice from various peoples and times. The base of the courthouse is designed to accommodate a wide range of public services in a “mall” of justice. The canyon creates an interior street, revealing individual agencies behind storefronts. Public services with the highest volume demand are located on the entry level. In keeping with modern courthouse design principles, the Regional Justice Center is served by three circulation systems that separate public, staff and inmate zones. Security is an integral part of the courthouse design. To project an open image of the courts to the public, the building was designed to have a positive and welcoming presence, while carefully and discretely integrating state of the art security controls into the building.